What comes to your mind when you think of exterior home maintenance? If I was a betting gal, which sometimes I am and other times I’m not, I’d venture a guess that nothing comes to your mind for exterior home maintenance. The reason why is because most of us don’t think about home maintenance that often. We usually don’t think about maintenance until something breaks. That’s not a good routine to get into though. So, today, we are talking about this topic and even giving you an outside home maintenance checklist to print so you don’t just react when something goes wrong. We will be the first to admit that keeping up with the exterior of the home can be daunting. It feels like we never have enough time to get the interior how we want it and then you want us to keep up with the exterior too? Today, we are breaking down what actually needs to be done on the outside of our homes, how often to do it and what season it might work best to do it in. 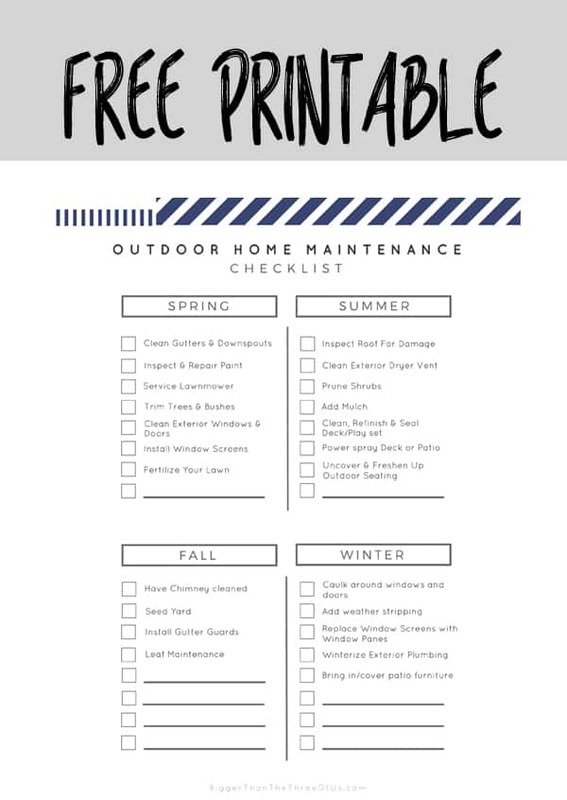 Make sure to get the printable outdoor home maintenance checklist to keep on top of it all. Power washing and how you can really make a big impact with this one tool. I personally love this power washer. We got it on Amazon last year and have used it quite a few times since then. We both got crazy with our dryer vents and Suzannah even documented her dryer vent situation. I replaced my mulch with river rock and have never looked back. River rocks or pea gravel are great alternatives to mulch as you don’t have to replace it each year. Gutter guard installation isn’t hard. Use my tutorial on installing gutter guards if you have trees that drop their leaves in your gutters in the fall. Exterior Checklist – Get your free downloadable exterior maintenance checklist and start taking care of your exterior. Find us on Instagram at Your Home Story Podcast.